Photo courtesy of Kettering University. Kettering University and Metro Community Development in Flint, Michigan, are working together to build an aquaponics farm that could eventually feed area neighborhoods. 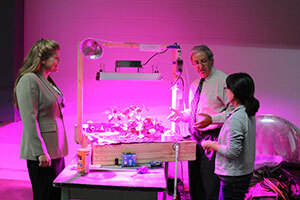 Metro Community Development first approached Kettering University to help research and plan the potential aquaponics facility, says Dr. Matthew Sanders, professor and director of the Center for Culminating Undergraduate Experiences at Kettering University. Once the project is finished, all parties involved hope to incorporate it into the Metro Community Development’s youth program, and to build a farm that will provide healthy, quality food to Flint residents. Although the project is underway, set-up costs have yet to be determined. Those involved with the budding farm are still weighing the pros and cons of what can be automated, and are researching different layout and lighting systems. The goal is to build an environmentally sound system. While the joint project’s main goal is to provide fresh produce to the Flint area, the project also aims to involve the community’s youth. “The intent of this program is to teach them life skills and broaden their awareness of environmental conservation while working together as a team,” Sanders says. This summer, a small prototype of the project was built and so far, it is working well. Project participants plan to use the Oak Business Center in Flint as a launching pad to start providing fresh produce to the city. “As the system and demand grows, we plan to expand to a larger location,” Sanders says. Currently, the main challenge concerns lighting. After the project is up and running, and plants begin growing, the project will begin to operate as a greenhouse and sell its produce. “At this time, we are not set up for CSA, but it may be an option in the future. Food donations of excess produce will be distributed according to MCD,” Sanders says. Currently, the farm is growing peppers, tomatoes, lettuce, and basil. Eventually, though, the finished farm will grow a variety of vegetables, fruits and herbs. Sanders hopes the current project leads to several greenhouses that could possibly be set up at the local farmers market.